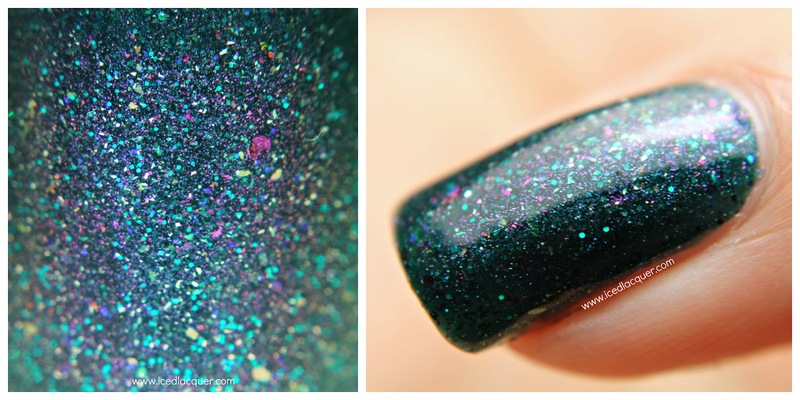 WingDust Wednesday: MORE New Shades! Hi loves! It may be April Fools' Day, but I'm not fooling you when I say that I have swatches of five more beautiful new WingDust shades to share with you! It is WingDust Wednesday after all. Are you ready for these? "Aftermath" - A deep teal base filled with tiny iridescent squares and hexes, iridescent flakes, and pink shimmer flakes. 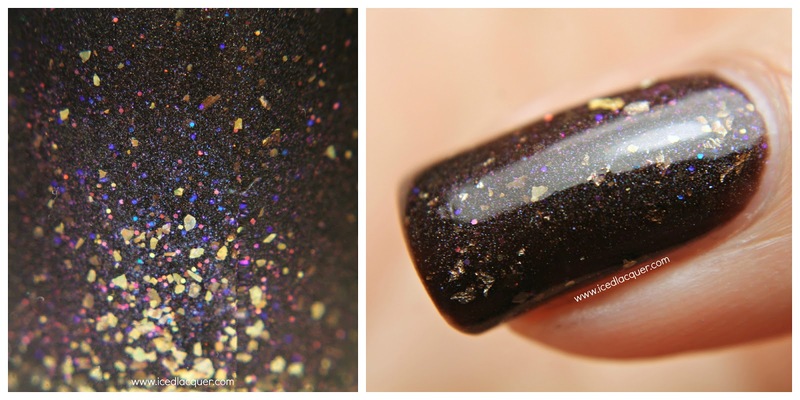 Super easy to apply and insanely sparkly. My photos show two coats plus top coat. "Instant Crush" - An orange shimmery base filled with iridescent flakes, pink shimmer, large gold flakes, and some scattered holo. This peachy shade of orange actually looks alright with my skin tone! My photos show three coats plus top coat. "Tall Dark & Roasty" - A chocolate jelly base filled with some scattered holo, purple shimmer, tiny iridescent hexes, and lastly 12 kt white gold leaf and 24 kt gold leaf flakes. The purple shimmer and flakes make the whole polish lean a little purple, which I love. My photos show two coats plus top coat. "Once Upon Another Time" - A super pale lavender holographic base filled with bright green hexes, lime green squares, large hexes in white and pale green, medium purple transparent hexes, and red shimmery flakes. This one is thinner, but totally packed with glitter which makes building it up to opacity pretty easy. My photos show three coats plus top coat. "Roads Untraveled" - A taupe creme base filled with periwinkle, aqua, teal, pink, and coral hexes, as well as some smaller gold and copper hexes, and shimmery purple flakes. It's so interesting how this shade manages to be neutral and colorful at the same time! My photos show three thin coats plus top coat. Color name: "Aftermath," "Instant Crush," "Tall Dark & Roasty," "Once Upon Another Time," & "Roads Untraveled"
My opinion: Orange and brown are two colors that I usually steer clear of when it comes to nail polish, but I found myself loving each one of these new shades. The purple tone in "Tall Dark & Roasty" makes it a beautiful shade of brown and "Roads Untraveled" is a shade of taupe that I really enjoy. 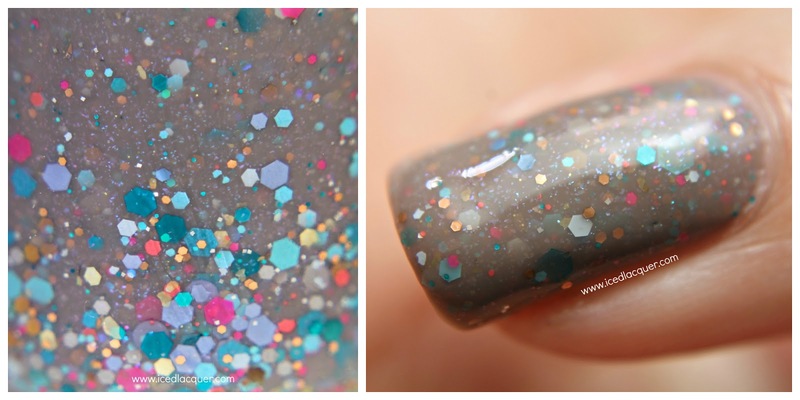 "Aftermath" is so incredibly sparkly and I love the use of iridescent, color-shifting flakes. Add these five shades to the three I showed you last week and you have a wide variety of new colors and finishes to choose from when adding to your WingDust collection! Aftermath. Holy gods, it's pretty. I need that for sure! Tall Dark & Roasty is *perfectly* named.